NYC, 02/14/2019, 3:00PM. Searching (2018): Father searching for his daughter. 102 min. Director: Aneesh Chaganty. Starring John Cho, Debra Messing, Joseph Lee. 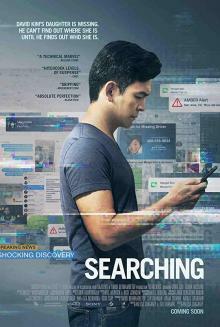 Searching is the first mainstream Hollywood thriller headlined by an Asian-American actor. The film was a financial and critical success, grossing over $75 million worldwide against a $1 million budget and receiving praise for its direction, acting, unique visual presentation and unpredictable storyline.